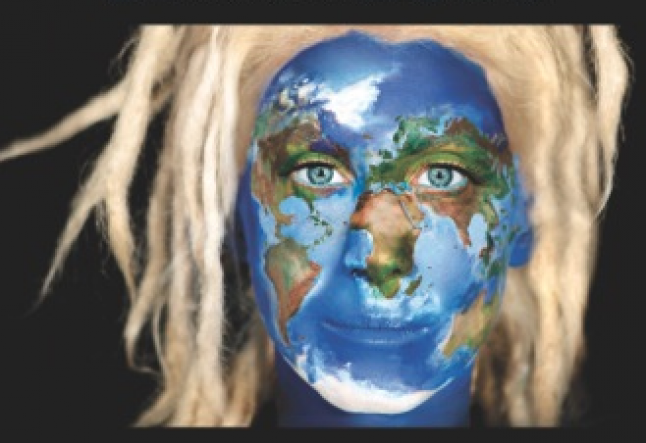 “Spring Groove is a world folk performer who sings in English, Sanskrit, Hebrew, Tibetan, Spanish & Italian. With over 100 concerts a year including, the opening act for Krishna Das at The Barcelona Yoga Conference, Bhakti Fest in Joshua Tree, CA and Australian & European tours with Dave Stringer the native New Yorker fuses Western Folk & Eastern Mantra music. 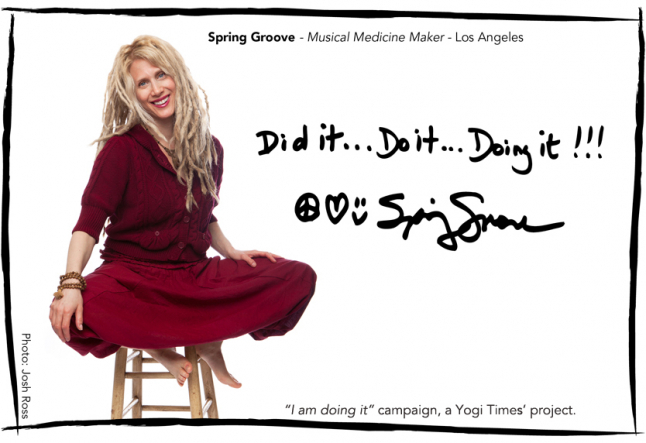 Spring Groove creates "MUSIC THAT IS MEDICINE FOR THE SOUL.”- Music Connection Magazine and her 10 thoughful CD’s range from rock, folk, pop, ecstatic & meditative mantra to World –Folk and have been played on both MTV and E! Television. She also produced her own Off-Broadway show with One Healing Arts Company, SPRING ALIVE, an ecstatic journey home. Spring’s concerts as well as SING YOURSELF ALIVE-Bhakti Vocal Workshop are transforming & opening hearts worldwide. Yogi Times: You are now a part of our Yogi Times “I’m doing it” campaign? Tell us how you are doing it & why? Spring Groove: I’m DOING IT by traveling the world, singing people’s hearts open. Better yet, encouraging and teaching folks how to do it themselves. I practice in private as well so that I can keep my energy the best it can be. I feel a responsibility to show up, Bright. This can sometimes take work. I do it because when this process is flowing I feel I am in my Dharma, everything aligns. I feel alive, full of PURPOSE LOVE and LIGHT. Spring Groove: My chosen profession is challenging. I have always sung and I knew from childhood that it would be my life's work. I was warned from the start it was not an easy road but those words did not sway me a bit. I started my career in the world of musical theatre. I grew up in a suburb just outside NYC and was fortunate to be taken to the theatre quite a lot. This was my first great musical influence. I'm certain if my parents were rockers and took me to many concert I would have had a rock band by the time I was 11 years old. It was theatre however that I was exposed to so that's the route I took. I was blessed to have lived out my early dreams of working on Broadway. When I left Broadway and NYC in search of a more personal and creative outlet as a songwriter the road got even harder. Record companies were falling apart and the business became more of an "everyman for himself" wild wild west free for all. It has forced me to carve out my own paths without guidelines or mentors. It has strengthened me in that I am forced to be brutally honest with myself. I routinely check to see what is working, what is not, how can I improve and evolve creatively, financially, emotionally. The strength I suppose lies in the personal responsibility I manage. Yogi Times: Was there a defining moment in your life that placed you on your current path? The path has been paved with a multitude of moments....Singing "you light up my life" when i was 6 or 7 while my mother played the piano (the only time I remember her playing the piano), recording my first CD in NYC, Attending my first kirtan concert in Brentwood, CA. Swapping apartments with a women in London I met on the internet so that I could spend my summer busking abroad. My teacher training at the Sivananda Ashram in the Bahamas. Touring with Dave Stringer. Having my Off-Broadway show, Spring Alive produced. Developing my workshop SING YOURSELF ALIVE, teaming up with my musical partner, Erhard Dengl... There are so many choices that open so many doors. Some choices I realized were great when making them, others not so much. YT: We see you are calling your new CD, WORLD- FOLK. Tell us about it and how it differs from your other CD’s? YT: Which cultural differences do you recognize when being on tour? Spring Groove: Well I do notice the difference in the way cultures are embracing technology. For instance CD’s are quickly becoming something of the past. They are being replaced with itunes and spotify. The new Mac computers aren’t even made with CD drives anymore. For this reason I have now manufactured Spring Groove USB credit card sized pen drives which include 3 full CD, videos and photos. This is for those who prefer to download music, The Americans, Swedes, Hungarians. Thank God the Germans, Italians and Swiss are still buying CD’s. I’m also still a fan and for them I have manufactured my new CD in its hard copy form. YT: What about the similarities? Spring Groove: It’s the similarities that interest me the most. That was the intention of the new CD, to focus on these. What I am discovering is that beneath traditional customs, language, dress/costume, all the things that separate us from our ONENESS, all of us spiritual beings are having a human experience. This includes the feelings of bliss, sorrow, joy, loneliness, fear, Love. We are reflecting one other. We don’t seem to be so different at the core. For instance rituals such as celebrating the coming of age are celebrated in almost every culture I’ve been exposed to. They look and sound different but their meanings are so similar. It’s a beautiful thing. Spring Groove: I suppose perseverance could be one of my great strengths. It's very easy to get derailed from the path I travel and of course I do. The important thing I believe is that it usually doesn't take me too long to get back on track. I thank the people I surround myself for that. This brings me to what might be my deepest weakness and that is easily attaching myself to that which feels good and the people I love. My home has been the road for years now. I'm constantly having to say goodbye to family and friends and this has not gotten easier over time. I am far better at arriving than departing. YT: How does your BHAKTI TRAIL column relate to your new CD? Spring Groove: In my column, FROM THE BHAKTI TRAIL I share my experiences, thoughts and questions that arise along the journey. It’s an opportunity to create a dialogue with the international yoga community. I never see myself as an expert of any kind, especially Yoga. I want to serve as a catalyst for conversation. I want to discuss things that aren’t commonly being discussed. I believe those are some less traditional ideas. I am not a traditionalist yet I benefit greatly from a practice that is. FOLKIN’ AROUND THE WORLD also mixes traditional and contemporary sounds. I’m enjoying this unusual but totally authentic representation. The bhakti movement is experiencing a second coming and it’s a bit different. We are different now then the folks in India in the 15th century. Makes sense to me that this movement would be too. I want to celebrate that. YT: Favorite things about traveling? YT: Where haven’t you been that you would like to go and why? Spring Groove: I would like to go to Minsk, Belarus where my grandmother came from. I’m sure it’s a very different place now but I would like to connect to my roots there. There is a town nearby called WOLYNEZ, which is my father’s last name. I would love to be invited to sing on that soil. Yogi Times: Who was your greatest teacher, and why? Spring Groove: I think I learn the most from the people in my life who are not Trying to teach but instead by those choosing to simply share their experiences. I get the deepest lessons in this way. I'm not a big fan of the idea that a Guru lives outside of ourselves. In many ways I feel this is a cop out from taking personal responsibility. I feel I learn from everyone come into contact with especially those that irritate me the most. Funny but true. We are just mirrors for one other, aren't we? YT: Do you have a favorite quote to leave us with?